For the August 2008 Kukai submit one to three HAIKU using the kigo green frog(s) /rain frog(s), tree frog(s) / toad. The exact word(s) must be used in the haiku. No more than a total of three haiku may be submitted. Haiku submitted to the kukai should not be workshopped, appear on-line in forums, or in print. Submissions: Friday, August 01, 2008 – Wednesday, August 20, 2008 Midnight. Voting: Thursday August 21, 2008 – Wednesday, August 27, 2008, Midnight. Voting procedures are explained at the bottom of this page. where are you, little one? from one thought to another . . .
in a glass of water. haiku moment . 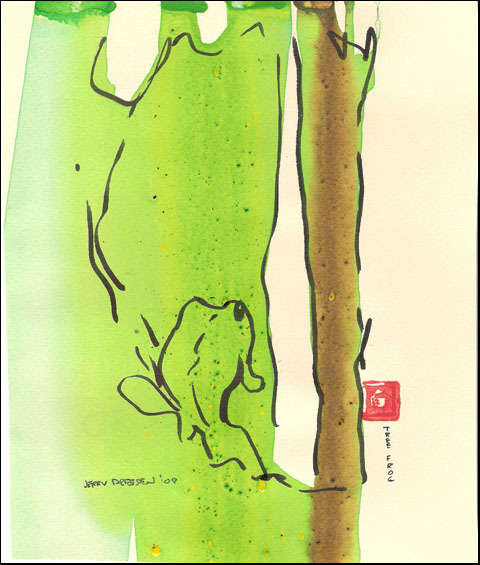 . .
Below is the ballot for the Sketchbook August 2008 "green frog(s) /rain frog(s), tree frog(s) / toad" Kukai vote. 3. Email your votes to: kukaieditor@poetrywriting.org When voting, please use the words “--frog” Kukai in the subject line of your e-mail.